Be it summer or the rainy season in Ho Chi Minh City, I tend to tackle the heat somewhat differently these days. 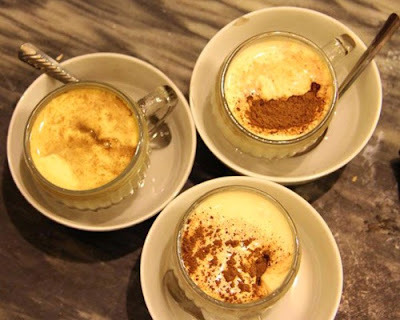 It is not an iced tea or an iced coffee that I turn to for relief, but a hot café trứng (egg coffee), which is a Hanoi specialty favored particularly on cold days. A southerner, it was love at first sight and first sip for me. I fell headlong for the amber-colored fluffy drink’s looks and its flavor. It is quite easy to prepare the drink, which was introduced in 1946 by Nguyen Van Giang, who used to work as a bartender at the historic Metrophole Hotel during the French colonial days, and one of my friends in Hanoi had given me the recipe. To prepare this eggy version of cappuccino, you need a phin cà phê (Vietnamese coffee filter), a clear cup, three spoons of roasted and ground coffee, three spoons of sweetened condensed milk, cheese and one egg yolk of trứng gà ta (free-range chicken egg). After boiling hot water is poured over roasted ground coffee and the beverage begins to drips directly into the cup, the egg yolk is whisked vigorously with a tablespoon of brewed coffee and half a tablespoon of cheese for three minutes until you end up with a frothy, fluffy mixture. Sweetened condensed milk is added slowly into the brewed coffee and allowed to sink to the bottom of the cup, resulting in two distinct layers of colors, the black of coffee and white of milk. The fluffy mixture is then poured on top as the last step. My café trứng is ready and and it is tasty, with a delicate balance between the bitterness of coffee, the sweetness of milk, and the rich, silky taste of cheese and egg. However, it still does not match my first café trứng experience in Hanoi- Best of North Vietnam last winter. Of course, the local coffee makers have their own secrets to make their drink special and unique, but in this case, I know for sure it’s not about ingredients or the recipe. My friend in Hanoi, Do Thuy Linh, did not take me to Giang Café, one of Hanoi’s oldest coffee shops, opened by bartender Giang in 1946 after he left the hotel to promote his own drinks, but to Dinh Café, owned and opened by Bich, Giang’s daughter, in 1984. 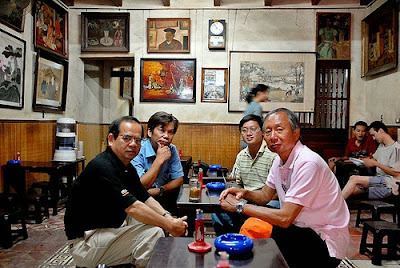 According to writer, historian, southern culturist Son Nam, coffee was introduced to the capital by French people several years later than in Saigon. While Saigon’s two first coffee shops, Lyonnais and Café de Pari were opened in 1864, Hanoi had to wait until 1883 to have its first café. 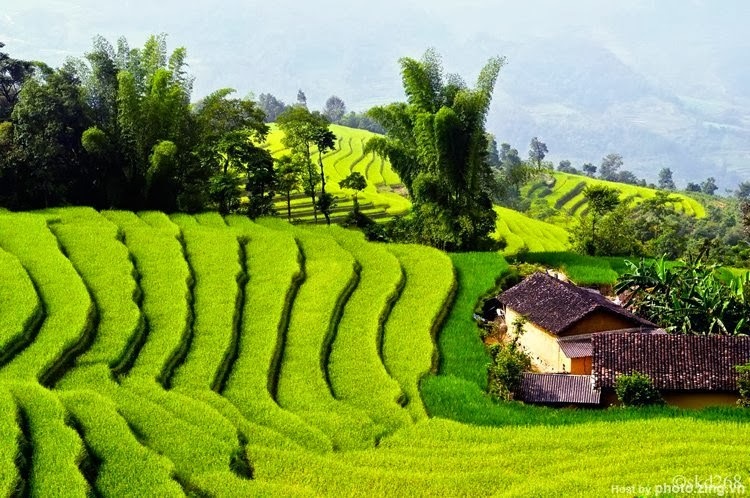 However, all these were opened and owned by French people and for French people and upper-class locals only, as other locals preferred tea and weren’t used to the black, bitter drink. 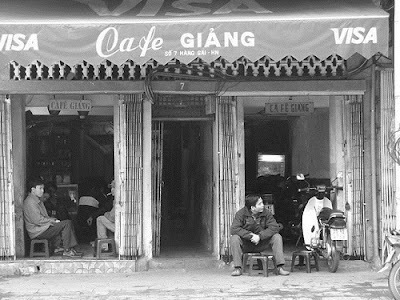 The Giang Café on 39 Nguyen Huu Huan Street, Hoan Kiem District is probably one of the first coffee shops owned by a Hanoian meant for Hanoians. 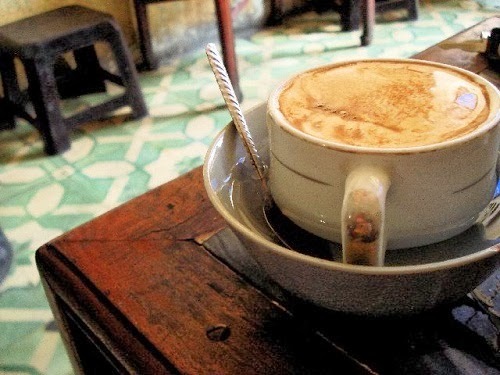 According to Giang Café fans, Dinh’s café trứng is not the best, but it still has its own “claws” to attract coffee lovers, and even foreign tourists. My friend obviously had her reasons to choose Dinh Café. It has a great location and a great view of the Hoan Kiem Lake, although to get that view it takes time, patience and a bit of competitiveness. 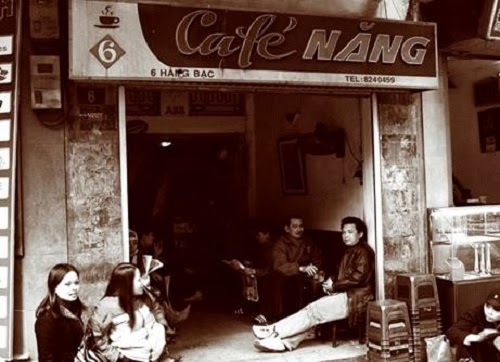 It is also an ideal place to observe how Hanoians enjoy their coffee, catch a bit of local culture, blend in and see café trứng work its magic on cold days. The shop is on the second floor of an old building in the Old Quarter. The first floor is occupied by a shop selling all kinds of bags and suitcases. To reach the 15-square-meter shop for our late morning coffee at around 9 o’clock, we passed through a small, narrow path on the right side of the bag shop, almost in darkness before encountering a century-old wooden staircase that shook with every step we took. Inside the shop, the wooden floor inspires less confidence than the stairs. The condition of the floor worries the owner Bich, a retired teacher. 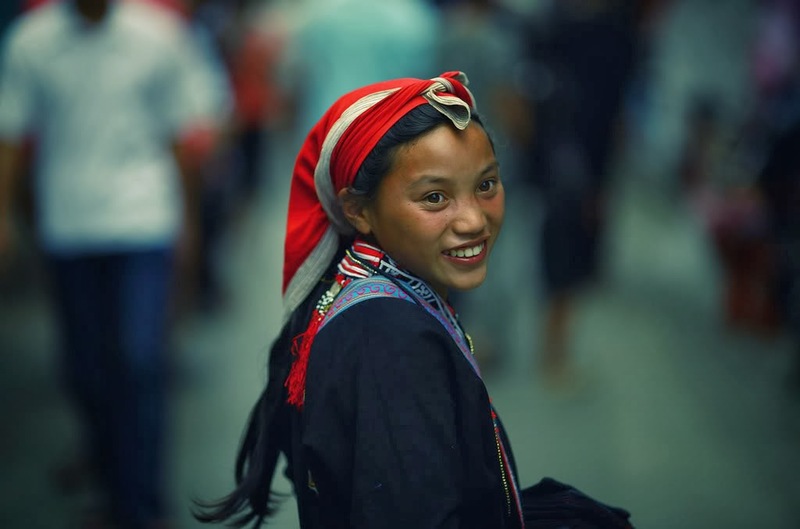 But whatever its condition, the room is always full of people, day and night, especially in winter of the North Vietnam. It seems to have enough space for everyone, no matter how many they are. Sitting on small polished wooden chairs and tables, people, young and old, men and women, don’t mind having their backs or other parts of their bodies touched by others and vice versa. They do not even notice it. They just focus on their conversation with their friends in a voice loud enough not to bother others. Hanging on the walls are some old paintings and decorations predating the beginnings of the Doi Moi period in 1986. A cassette is placed on the bar on the right side of the room for customers to bring and play their own tapes. It’s rare to find this sight in Saigon where people prefer bigger seats and wider spaces, and don’t like to have their private space violated by others. “Is it because of the cold weather that people get close to each other?” I asked Linh, who stands next to me waiting for our seats since there’s no place left for us. Yes, the 15-square-meter shop still manages to have a place for customers to wait in a line. “Why doesn’t the owner renew and enlarge the shop to receive more customers? Surely it is not that she cannot afford the renovation,” I remarked. “She can, but here, people prefer to enjoy coffee in such places,” Linh said. After five minutes we got our own seats near the entrance to the French-style balcony facing the lake outside, after a couple of customers left. “We are lucky,” said Linh, winking. “Look, we are very near the balcony chair and table, the most sought after in this coffee shop. To sit there, we have to wait or arrive early.” The balcony seat was occupied by a couple of foreigners. Linh and I are not the only ones who are coveting the balcony, others are constantly casting glances at it even as they talk. They are waiting for the couple to leave. We ordered a café trứng and café đen nóng (hot black coffee). Half an hour later, the foreign couple left and the place was occupied by two young men. I smiled at Linh at our “loss.” But the focus shifted to Dinh’s café trứng, served in a small non-transparent cup. People in the north typically do not use much sugar and prefer the salty taste, but their most famous coffee is sweet, sweet enough to satisfy my southern palate. Another friend, Hoang Minh Thong, a young lecturer at the HCMC University of Social Sciences and Humanities also agreed with me that the best place to enjoy café trứng is at café in Hanoi. He visits Giang Café and Dinh Café to enjoy café trứng and other traditional drinks everytime he visits the capital city, he said.